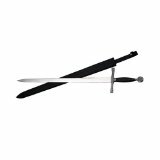 Trademark King Arthur Sword, 4.. Product weight is 3.83 lbs. 40 inch King Arthur sword sword comes with a black leather sheath. The hilt and pommel are beautifully engraved with a medieval design 40 inch Pewter King Arthur Sword.Complete your medieval collection with this 40 inch King Arthur sword. This sword comes with a black leather sheath. The hilt and pommel are beautifully engraved with a medieval design with a pewter finish and a Black handle.